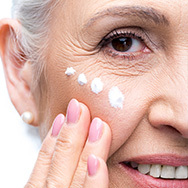 Choosing an anti-aging moisturizer that works for you isn’t easy. The one you’re eyeing might have an impressive ingredient list, but it’s also important to consider the skin type it’s formulated to address. Contrary to popular belief, age is not a skin type! For instance, if you have concerns with wrinkles and loss of firmness, but are also dealing with oily skin, a thick, emollient cream isn’t the way to go. Likewise, very dry skin with wrinkles won’t do well with an absorbent, matte-finish formula. Paula’s Choice Skincare knows how important it is to provide options for every skin type, which is why we developed a series of anti-aging moisturizers designed to address your skin type and aging concerns. RESIST Barrier Repair Moisturizer with Retinol – The anti-aging power of retinol is combined with antioxidants and skin-replenishing ingredients in this silky, lightweight lotion that hydrates and delivers wrinkle-smoothing results. RESIST Intensive Repair Cream – A rich, creamy soufflé containing retinol that visibly restores firmness and radiance to very dry, dull skin. RESIST Skin Restoring Moisturizer with SPF 50 – Superpower ingredients niacinamide, shea butter, and licorice nourish and replenish skin, while broad-spectrum SPF 50 protects against the sun damage that causes many signs of aging. RESIST Anti-Aging Clear Skin Hydrator – An ultra-light cream-gel that targets an uneven, blemished skin tone and enlarged pores, while delivering a potent blend of anti-aging ingredients, including niacinamide and vitamin C.
RESIST Youth-Extending Daily Hydrating Fluid SPF 50 – A remarkably lightweight moisturizer with sunscreen that still leaves skin feeling smooth and hydrated, while providing key antioxidants to defend against environmental stressors that can cause signs of aging. RESIST Super-Light Wrinkle Defense SPF 30 – This matte-finish, sheer tinted sunscreen features mineral zinc oxide as its active ingredient along with state-of-the-art antioxidants in a formula that’s gentle enough for sensitive skin, even skin prone to rosacea.